The Redskins came into this season with lofty expectations after surprisingly winning the NFC East last season and returning a young core on the offensive side of the ball. Many publications, including this website, predicted they would win their division much more comfortably than they did last year. Things have not gone to script from the very beginning for this team, and they sit in a 3-7 hole, and all but out of the playoff picture despite playing in the worst division in football. With such poor results in the wake of their run last season, the questions about Mike Shanahan’s job will undoubtedly begin to creep up, especially with a notoriously impatient owner at the helm. Canning Shanahan at this point in the rebuilding process would be a massive, and fatal mistake on a number of levels, and the Redskins need to stay the course for at least one more season. It is never discussed enough because he was such an electric player as a rookie last season, but Mike Shanahan, and his son as offensive coordinator to a lesser degree, were mostly responsible for Robert Griffin III’s success in 2012. Going into his rookie season, the Redskins offensive coaching staff set up a system perfectly tailored to RGIII’s skill set, and he executed it almost flawlessly. The threat of Griffin’s world class speed not only opened up huge holes for Alfred Morris to give the offense a strong, sustaining rushing attack, but it also provided Griffin with a lot of wide open lanes to throw to in the middle of the field. Linebackers and safeties were constantly cheating up to the line of scrimmage because they were so terrified Griffin would take off running down the field, and that allowed receivers to get open in between the numbers where Griffin displayed elite accuracy and ball placement to allow those receivers to get yards after the catch. It is almost laughable to hear reports about Robert Griffin supposedly not getting along with the coaches, or to listen to his comments after the loss to the Eagles where he essentially implied the team was outcoached. Griffin has all the potential in the world, but he is starting to develop an annoying habit of not knowing when to stop talking. None of us truly know what is going on behind the scenes with this team, but if the rumors are true and RGIII does want to talk the Shanahans out of town, the guys needs a serious reality check. Due to his devastating knee injury, Griffin was unable to participate in any real offseason activities coming into his second season in the league, and that is the offseason that is actually more crucial to participate in than the first one. There is a reason so many people talk about the “sophomore slump” for quarterbacks, its because defensive coaches around the league have a year’s worth of tape on you and are more often than not able to figure you out. They know your tendencies, they can exploit your weaknesses, and they will not allow you to get away with “gimmicky stuff” that the Redskins pulled off with ease in 2012. Athletic quarterbacks like Griffin are especially susceptible to this inevitable step backwards. While they are able to come in, catch the league off guard and take it by storm (think Cam Newton, Vince Young, and yes, even Tim Tebow) they are much less likely to get away with that the following season and the years to come. Newton, while by no means a finished product, is a great example. While he did not show much improvement from year one to year two, he has taken massive steps forward in his third year in the league. Cam has learned he cannot carry this team, and needs to play within himself and the confines of the offensive game plan. He is firing less shots recklessly downfield, is much more judicious with his runs, and off the field, he has learned when to pipe down and keep the focus on the team. And guess what, the Panthers are winning football games because of it. Many people chuckled when the much-maligned Mike Shula was promoted from quarterback’s coach to offensive coordinator after Rob Chudsinski left to become the headman in Cleveland, but the Panthers organization was right to keep a familiar face, and system in place to keep Cam comfortable. A change in the offensive staff would have only stunted Newton’s growth and the same would happen to Griffin if the Redskins let go of Shanahan at the end of this season. To expect Robert Griffin to walk into this season and suddenly turn into a refined pocket passer, after never being one in his life, while having missed an entire offseason was silly, unrealistic, and frankly unreasonable. However, can it happen in year three under still one of the best offensive minds the league has to offer? You bet it can, if they stay the course. The Panthers' path to success for Cam Newton in his third season should provide the Redskins with hope a blue print for RGIII. 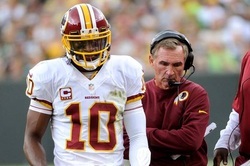 This time next year, Mike Shanahan will be in the last year of his contract. People often say you absolutely cannot have a head coach go into the season on the last year of his contract. What a silly notion that is. If you do not want to make the coach appear like a lame duck, tack another year onto his contract. There is no need to go doling out a long-term extension, but just give him another year so you are not worried about the possible ramifications of him coaching out the final year of his deal. If an owner is prepared to eat the money to fire the coach to avoid that situation, it would seem only reasonable they are willing to eat the money a year from now as well. There also seems to be notion out there that players will not put their best effort forth for, or will tune out a lame duck coach. There are two problems with that theory. First, any player worth his weight who knows a coaching change is coming should be trying to put their best tape out there so they can either stick with the team after the change, or still be desired by other teams if the new coach lets them go. Secondly, if there are players on the Redskins roster who are uninterested in following a proven head coach with two Super Bowl rings on his fingers like Mike Shanahan no matter what the extraneous circumstances, they probably are not guys you want on your team anyways. When looking into the proverbial crystal ball for the Redskins future, there is both good and bad news. As it stands today, this Redskins roster is not a very good one, and it might look worse a few months from now. The defense is atrocious and at a bare minimum will need at least four new starters; three in the secondary and someone to take over for London Fletcher, who is without a doubt finished. Josh Wilson, DeAngelo Hall, Brandon Meriweather, and Reed Doughty should all be gone this offseason. The team will probably roll with David Amerson at one of the cornerback spots in hopes that his baptism by fire this year will make him truly ready to take over in year two, but the other three spots in the secondary riddled with questions. That is not even getting into what they need on offense, where outside of Pierre Garcon and the surprising Jordan Reed the group of pass catchers desperately needs an infusion of talent. The Redskins also need to bring in or develop some new interior offensive lineman because guys like Chris Chester, Will Montgomery, and Kory Lichtensteiger seem to be in some sort of contest to see who can get RGIII killed first. The needs are many, but the draft resources are few; Washington will be without a first round pick for the second straight season. The good news is that, the Redskins will finally be out from under the devastating cap penalties the NFL has levied on them the past two seasons. The Redskins do not have many key free agents to retain, with Brian Orakpo being the only real name of consequence on the list, and should have plenty of money to toss around to free agents. With a proven head coach in place and an exciting young prospect at quarterback, Washington should have no problem attracting quality players to their facility. They don’t need to go all 2011 Eagles or 2013 Dolphins and spend like mad men, but they have the funds to make several quality mid level free agent signings to replenish the talent on this roster, much like they did prior to the 2011 season. They would be wise to go for this home run strategy, because when you scan across this division, the only team that really looks to be emerging as a consistent future threat is the upstart Eagles under Chip Kelly. The Cowboys are probably one more inevitable late season collapse from wholesale changes, and the Giants are an underperforming aging team. Neither of those teams should scare the Redskins over the next five seasons. Even the Eagles, who are brimming with promise right now and will win the division this year, could experience their own sort of “sophomore slump” next season. As bad as things look right now, the Redskins could find themselves right back at the top of this division a year from now. If the Redskins decide to move on from Mike Shanahan and scrap the major rebuild he has been heading up the last four seasons, all bets are off. After shoveling through the mess this franchise threw him into when they hired him, Shanny is just now finally getting all the pieces together. If the Redskins cut him loose now, they will never take that next step forward, and will likely find themselves perennially at the bottom of this division once again. All the success the Redskins have with Alfred Morris in the zone running scheme, leaves with Shanahan. The offense that has so often put Robert Griffin III in positions to maximize his skill set even as he has struggled this season leaves with Shanahan. The ability to get top ten production out of guys like Garcon and Reed, leaves with Shanahan. The respectability and veteran leadership this team has now, and painfully lacked for the better part of two decades, leaves with Shanahan. If Robert Griffin and Daniel Snyder really want to see if the grass is greener without Mike Shanahan, they will be digging their own graves in that very grass soon enough. The team is frustrated, the players are frustrated, and you bet the fans are frustrated, but when it comes to the future of the Redskins and their head coach, patience is not just the best solution, it is the only solution. If one of the more storied franchise in the NFL does not want to jeopardize the future of their best asset, and return to the years of mediocrity they were mired in before Mike Shanahan’s arrival, they will heed this warning. Stay the course.